Clear the area of any surface rocks and vegetation, as well as removing the top four to six inches of soil from the bed of the pond, lake, sewage lagoon, etc. For best results, smooth the area with a roll or a drag plank. 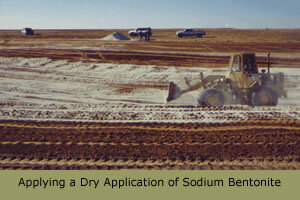 Cover the area you want to seal with the predetermined thickness of our Granular Texas Sodium Bentonite. A mechanical dry fertilizer spreader with controlled distribution is a good application device as well as a front-end loader. The main idea is to get a solid cover over the area you want to seal. Avoid leaving bare spots that may result in seepage. 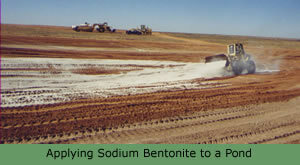 It is probable that these bare areas will be covered as the Sodium Bentonite begins to swell. However, applying a uniform layer during application assures complete coverage and a successful seal. After spreading the Sodium Bentonite, carefully replace the top four to six inches of soil removed earlier. Avoid disturbing the Bentonite liner. Then tamp the area to compact the surface. Begin filling with water (gentle flow) if possible. The full saturation of this product may take approximately 60 - 90 days.